EconWeekly: Has the profit share risen too far? Comment and reply. Has the profit share risen too far? Comment and reply. John Hussman doesn’t like my essay on the U.S. profit share. He says that I made mistakes, and he denies my conclusions. 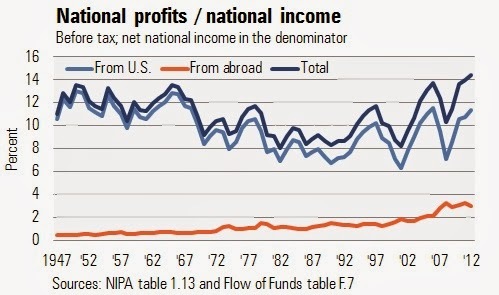 I have revised my “unfortunate bit of analysis,” and the verdict stands: the U.S. profit share in the medium term has a trend, which seems to be driven by rising foreign profits. I’ll do the play-by-play of Hussman’s critique in a minute. Let me first look at the big picture. On my blog post I defined the profit share as the ratio of aggregate profits to national income, and I pondered whether it has risen too far. John Hussman and Jeremy Grantham, among others, say it has. I am not so sure. The debate hinges on what is the ‘normal’ level of the profit share. Hussman says: The profit share fluctuates around a stable mean. When that share drifts away from the historical average, it reverts to the mean. I say: The profit share has a medium-term trend, and over the business cycle it veers around that trend. The trend may change in the future, and I don’t know when or in what direction. Moving in giant waves, the trend profit share rose in the 1940s and 1950s, fell from the 1960s through the 1980s, and has been rising again since the early 1990s. In the medium term economic forces may push the profit share away from its historical average—and keep it there for decades. Academics have proposed a few theories (1) for why that is; for example: globalization, and the decline of the relative price of investment goods. Above all, the academic literature has shown again and again that the capital share has a trend (here, here, here, here, and here). Perhaps if you are trying to forecast the profit share 30 years out it is prudent to use the historical mean. But many analysts’ horizons are shorter than 30 years. And over those shorter horizons it is unclear that the full historical average is our best guess of where profits will go. Now to the details of Hussman’s critique. Stock market analysts often use corporate profits divided by GDP as a proxy for profit margins. On my blog I put forward a slightly different ratio, national profits over national income, which should be called the profit share. Hussman points out a flaw of my profit share: the numerator is profits in gross terms, but the denominator is income in net terms. This mismatch, Hussman says, "introduces additional noise." The two series move in lockstep. My error does not introduce much "additional noise," and it does not flatten the trend that starts in the 1990s. On the denominator side, then, Hussman succeeds at making no difference at all. On the numerator, Hussman has a beef with my using pre-tax profits. “The entire analysis,” he claims, “is actually driven by the fact that pre-tax profits have been inadvertently used in the numerators.” That is false. The trends are still there. 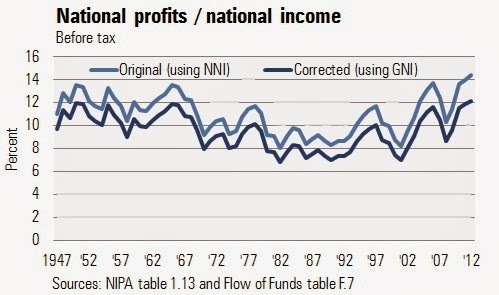 After-tax domestic profits (light blue line) start increasing in the early 1990s. Profits from abroad (the orange line) have a clear, long-term upward trend. And total profits have a medium-term upward trend, at least partly driven by foreign profits—and that’s the gist of my whole analysis. Hussman says that the role of international profits is secondary. He claims that foreign profits as a share of GNP have been "contracting since 2007." But the data say that in 2007 the foreign profit share was 2.4%, and in 2012 it was 2.5%. 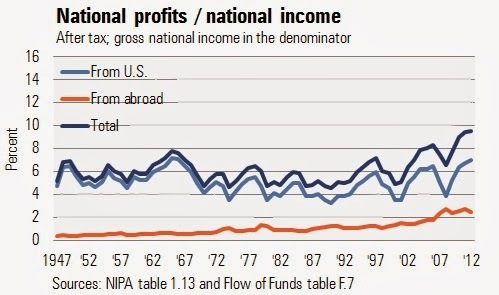 Besides, the share of foreign profits has been rising for decades, not just over the last five years. Perhaps Hussman is using different data; I don't know, because I don't see the sources for this part of his commentary. What I do see is an inconsistency. Hussman mentions the change in the share of foreign profits over five years. Then in the next paragraph he writes "Stocks are not a claim to a few years of cash flows, but decades and decades of them." 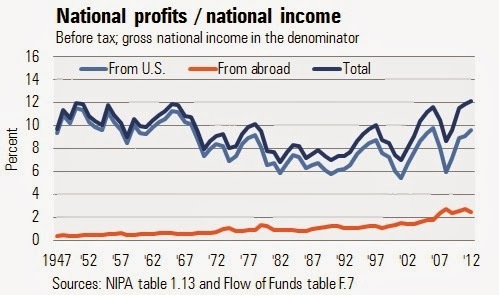 Foreign profits have been rising for three decades. Isn't this something you should factor into the long-term outlook? I don't know whether the trend profit share, domestic or foreign, will continue rising in the future. The actual profit share will have cyclical ups and downs. But the gravity center of that zigzag is uncertain. Will it be the historical average, say 5%? Or will it be the trend level, which in the future might be 6%-7%? What is the basis for assuming that the medium-term trend, which began in the early 1990s, will end suddenly? Please weigh all plausible scenarios. Agnosticism is a good thing. 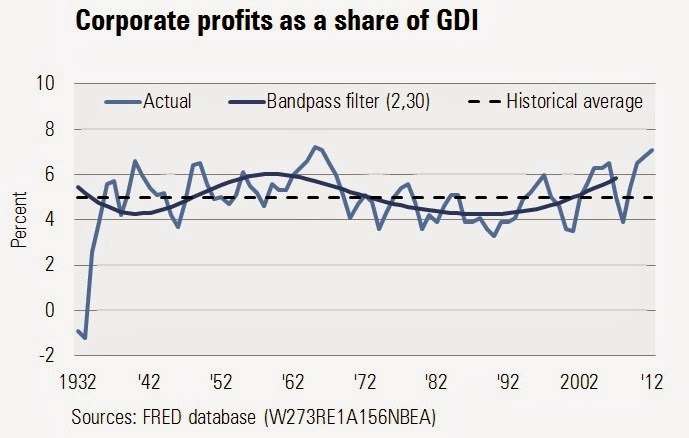 Corporate after-tax profits as a share of GDP, GNP (or even net national product if one wishes to use that number) are steeply above historical norms, and the pre-tax profit share is also at record levels. This fact can be fully explained by mirror image deficits in household and government saving - a relationship that can be demonstrated across decades of historical evidence. As a result of a severe credit crisis and a sustained period of lackluster economic activity, we’ve seen a fiscal deficit (elevated transfer payments to households and shortfalls in tax revenue) combined with weak household saving. The combined effect is that companies have been able to maintain revenues while paying a very low share of income to labor and taxes. He has made this point, at length, here. Writing about that thesis is beyond the scope of this blog post, which is already too long. Let me just say that the co-movement of corporate profits and non-corporate saving does not imply that profits will regress to the mean in the medium term. This paper shows one model where the two variables go hand in hand, and yet profits do not necessarily mean-revert.